I follow a lot of makeup artists, bloggers, celebrities, and random beauty accounts on Instagram, and I noticed how most of them go overboard when it comes contouring. Originally intended for on-stage performances, I can say intense contouring has definitely gone mainstream. To be honest, I don't think the intense contouring trend will ever be for me. For one, my skin tends to flake when rubbed immensely. Plus, I live in a tropical country. So just imagine how heavy and uncomfortable it would feel if I hit the streets wearing Kim Kardashian's face. On the other hand, I plead guilty to being a big fan of subtle contouring. I have a round/ovalish face. So yeah, a little contouring here and there definitely adds dimension to my face. I have been using Guerlain Terracotta as my bronzer since 2014, and it works magic for me. 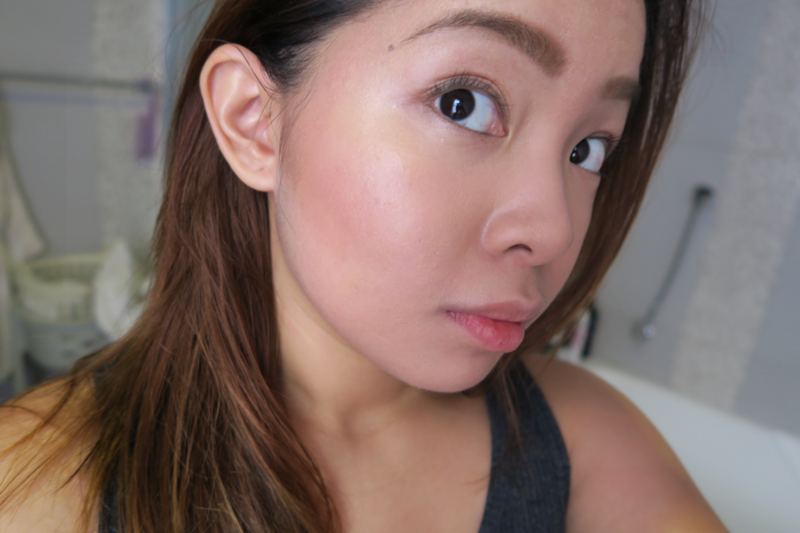 Earlier this month, I tried looking for a more affordable bronzer to try. And luckily, while browsing for products at SM Department store, I checked the aisle of E.L.F. 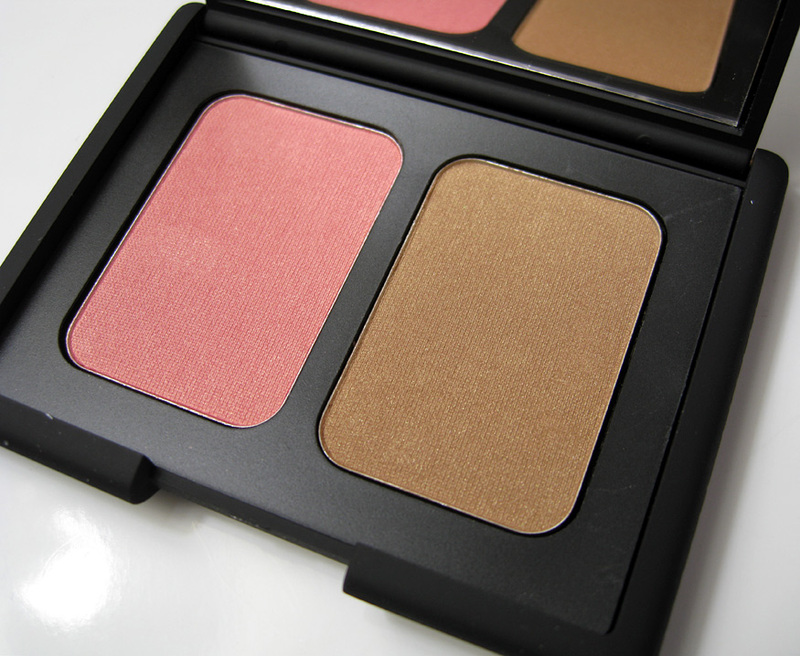 cosmetics and found a blush and bronzer powder duo priced at Php 249.75! It's available in 3 shades (see below). I ended up getting St. Lucia. For the packaging, I can't help but compare it to NARS. It features a big mirror, which I find particularly handy. 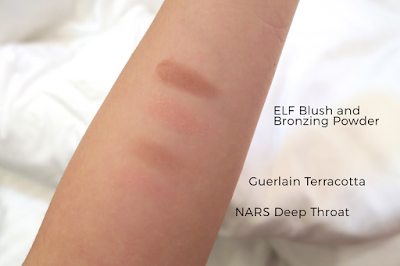 The only difference I noticed is that the NARS packaging comes in a velvety matte finish. For the product itself, I find the quality to be annoyingly chalky. I also observed that it crumbles easily. But for what it's worth, I'm willing to overlook these observations. For the color pay off, both the blusher and the bronzer are impressive. The colors are really pigmented, which means a little goes an incredibly long way. I applied the bronzer to the hollows of my cheeks extending it to the sides of my forehead using my Happy Skin angled blush brush. 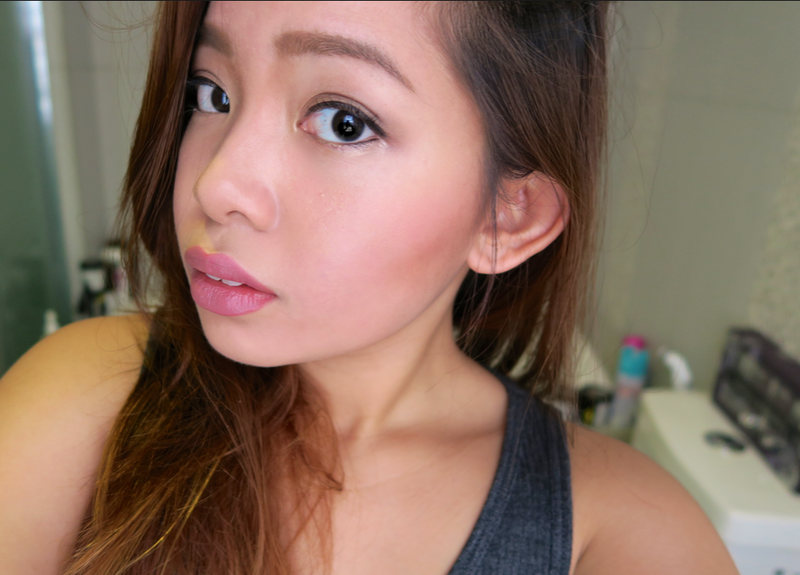 For the blusher, I dusted it lightly on my cheeks using the same tool. Not only did I tap the brush several times prior to applying, I also dusted some of the products off on a piece of tissue paper to make sure I don't apply to much. The biggest problem I encountered is the bronzer's blending rebellion. This is definitely not the type of product wherein you can easily blend the colors out to make it appear softer. You really have to be careful when using this product as you cannot diminish dark blotches by simply blending/stippling over the area. The key to using this product effectively is by using it sparingly using subtle and careful strokes. I like how the blush adds a flush of color to my cheeks and at the same time provides a fresh shimmery glow. For the bronzer, I appreciate how it was able to really contour my cheekbones. If you're looking for an affordable blusher/bronzer combo, this is actually a pretty decent product to try. This is a great product if you're after something highly pigmented and long-lasting. The E.L.F. Contouring Blush and Bronzing Powder duo stayed on my face the whole, hooray! But overall, I don't think I'll repurchase it nor add it to my usual routine. It's just that I prefer blushers/bronzers with a silkier finish. Nothing personal, St. Lucia. 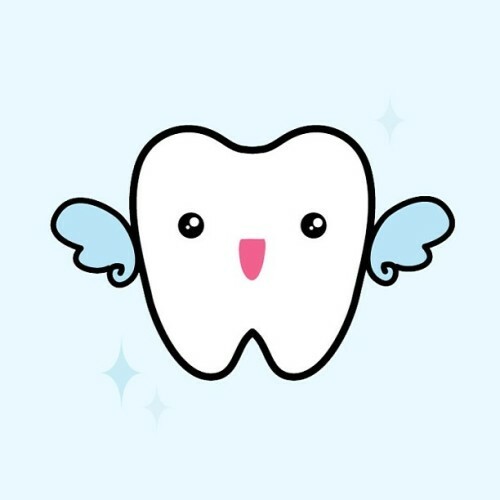 When I was 9 years old, I got one of my milk teeth extracted. It didn't hurt at all and the recovery process took place in a matter of 2-3 days. How I wish I could say the same for my recent experience! 3:50PM - I arrived at the clinic 10 minutes before my scheduled slot. Since there weren't any patients that time, I was immediately accommodated. I asked for the prescription prior to the procedure. I was instructed to take Amoxicillin (antibiotic) - 3x for 7 days and Ponstan (painkiller) - 3x3 for 3 days. After the 3rd day, take only when needed. Before the actual procedure, the dentist explained to me the whole process including realistic post-op expectations. She said bleeding, swelling, and pain are normal side effects, and true enough, I experienced them all. She told me I could take painkillers before the actual procedure to avoid unguarded pain once the anaesthesia wears off, and so I did. For the sake of visualization, my upper right wisdom tooth is near the sinus area and has no chance of erupting. My lower right wisdom tooth, on the hand, has partially erupted, with majority still covered with inflamed gums. I guess it's safe to say both are impacted. 4:10PM - My dentist began by injecting 2 shots of local anaesthesia on my lower wisdom tooth area. The needle was inserted about 1 inch into the side of my jaw near the back-most portion. I really felt the initial injection. I would describe the pain to be very distinct, but I would consider it tolerable. After the first needle, my right jaw was numb in a matter of seconds. That said, the second injection was a breeze; I barely felt it. When I saw the dentist holding a scalpel, my heartbeat literally raised. In my head I thought, "A scalpel. I used this in high school to dissect a frog, and now it's going to be used...on me." I palpitated and asked for a short break. I honestly thought I was going to faint at that point. 4:30PM - My dentist slit my gums open to access the tooth buried under. I saw the amount of blood being pumped out from my mouth. Not a nice view! At this point, I asked if I could get another shot of anaesthesia just incase, which she granted. 4:50PM - She then proceeded to take out the tooth, alternately drilling the area surrounding the tooth and wrenching at it with some sort of lever. I barely felt anything except for the pressure coming from the wrenching. She then stitched the area up using dissolvable thread. 5:20PM - The process was the same for the upper wisdom tooth, except that lots of drilling happened due to my tooth being located way up. Let's just say it's somewhere near the sinus lining, very far from the alignment of my teeth. The whole procedure took almost 2 hours. Immediately after, a gauze was placed to absorb the blood. They also gave me a pack of gauze to take home just incase I would need them. They also provided me a cold compress to soothe the swelling. I went home right after the surgery. As if I could go elsewhere. Haha! When I got home, I went straight to my room to change the gauze. I felt my body weaken at that point. I felt dehydrated. I guess it's part of the side effects. At that point, I didn't care whether there was blood gushing from my mouth, I reached out for a bottle of water then drank it halfway. Tangy. Then, I folded the gauze pad about three times then applied it to the open wound, just like how the dentist taught me. Note that I had to go back to the washroom every 20 minutes to change the pad. Spitting out saliva mixed with blood is also normal post-op. Around 8PM, I noticed there was still a lot of bleeding happening, so I tried using a teabag instead. And true enough, the bleeding lessened. At around 11PM, there was no more bleeding. At that point, I was relieved since I could eat 'conveniently', you know, without having to swallow my own blood. For my late dinner, I swallowed (yes, swallow) thinly sliced sausages. Then I took my meds (antibiotic and painkiller), then went to bed. I stacked up my pillows as suggested by the dentist. Afraid that blood would gush through my sheets, I wrapped the sides of my face with a towel. This is probably the most uncomfortable day of them all. The feeling of waking up was very foreign. My right jaw was still very numb and I couldn't open my mouth. At this point, the swelling of my jaw was more prominent. I began rinsing my mouth with warm water and salt after every meal. I also began brushing the left side of my teeth. I spent the day in bed with a cold compress on my right jaw. Thank god for TV, books, and my ever-so-reliable laptop. With regard to eating, it was really hard at first, I was restricted to eating foods that do not require chewing. I was stuck with soup, yoghurt, thinly sliced sausages, scrambled eggs, cranberry juice, ice cream and silkmilk. The swelling reached its peak on Day 2. Day 2 was a duplicate of Day 1 wherein I spent the whole day in bed, but this time without a cold compress. My lip, tongue, facial skin, mouth lining, basically all the tissues surrounding my right jaw, was still very much numb. The swelling started to subside, but my jaw was still very much numb. At this point, I started brushing the right portion of my teeth, but of course avoiding the recovering areas. I still couldn't chew at this point, and I started feeling discomfort in the extracted areas more distinctly at the lower part. So I checked my mouth using a flashlight then noticed white stuff surrounding the area of extraction. At that point, my paranoid self googled what those white stuff could possibly be. Results included: mouth sores, infection, food debris. The swelling was almost gone, maybe around 85% gone, but my jaw was still very much numb. I finally started eating food that require minimal chewing. Discomfort was more prominent, but subsided a bit in the evening. The swelling is gone by 90%, but again, my jaw was still very much numb. Finally, I started eating solids including beef jerky (thanks Regine!). I noticed the white stuff I observed on Day 3 Post-op turned pink, turns out they were my gums in the process of recovering. I was instructed to go back to Metrodental for the dentist to check if I acquired any complications. Luckily, the wounds have all closed. I was also told that I could go back to my usual routine. So yey! But the numbness of my jaw has not subsided yet, so I was given a prescription for the numbness to fade. My dentist said it was due to my lower wisdom tooth being so close to a nerve which lies near my jaw. I was told that once the numbness fully subsides, maybe in a matter of 1-2 weeks, I can have my upper and lower left wisdom teeth extracted. I guess by then I wouldn't palpitate when I see the scalpel for the second time around. After my appointment with the dentist, my parents and I drove to SM Megamall to eat at DADS. I have never felt so excited to eat at a buffet. That said, this particular experience made me realize a lot of things. One of which is to never take anything for granted. Only when you lose something, for my case temporarily not being able to eat any food I want, do you realize the value of it. Second is that no man is an island. Well, for my case, that is. The past few days, my mom has been the one taking care of all my needs. From thinking of what food I can conveniently eat, to keeping track of my medicine intake schedule, I am definitely blessed to have such a loving and caring mom. I don't think I'd be able to survive the whole ordeal without her. Last but not the least is that there's always a rainbow after the rain. True, it was a very uncomfortable experience. But thinking about it now, atleast I'm halfway done. Once I get all of my wisdom teeth extracted, my orthodontist can start fixing the slight crowding of my teeth. So yey to a nicer smile! Enough of the cheeseballs, I'm just so happy that I can eat solid food already. Update: Swelling totally subsided on Day 8 Post-op!